2008’s rather brilliant Icon was a bit of a highlight for me that year, and it’s little surprise that the broadminded French death mob are once again pushing at the genre’s boundaries to create something of a standout in their chosen field. Alas, there’s no random forays into French rapping this time around, but Benighted have plenty of surprises up their bloodsoaked sleeves to ensure that Asylum Cave is just as enjoyable, if not quite up to Icon’s high standard. Switching labels to Season Of Mist from Osmose hasn’t resulted in any toning down – quite the contrary, there are moments here which are far sicker than anything on Icon. Asylum Cave moves onwards from the rip-roaring Cryptopsy-meets-Aborted rampage of its predecessor, focusing a little more on a more complex and grinding approach. The title track’s opening Bugs Bunny sample leads into a violent grunt/scream trade-off, deathcore grunts in follower Let The Blood Spill Between My Broken Teeth moving into wild soloing and crunchy deathgrind, before Prey turns melodic with almost thrashy speed-shifting and group shouts. There’s a similar formula that runs throughout the album, yet no two tracks are quite the same, from Hostile’s almost doom-death second half to Shadow’s Descend atmospheric flourishes. Without a doubt, Fritzl takes the biscuit for the sickest puppy overall, childish voices at the start leading into obscenely catchy riffs and creepy Germanic whispering, making for the kind of compelling yet oppressive atmosphere which makes you deliberately not look up the lyrics. Aborted’s Sven pops up on Unborn Infected Children to add vocal spewing to the infectious groove, Mike from Devourment on A Quiet Day and there’s a great moment on Drowning when DJ scratches are thrown into the violent mix, to wonderfully fun results. That’s a good way of summing this album up, ultimately – fun. 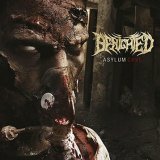 All too often these days, it seems that death metal bands forget that music is supposed to be enjoyable to listen to; Benighted could never be accused of this, and whilst Asylum Cave is a slight regression from Icon in terms of experimental everything-goes anarchy, it’s still a damn sight better-crafted than many other grunt ‘n’ blast relics out there. Recommended.